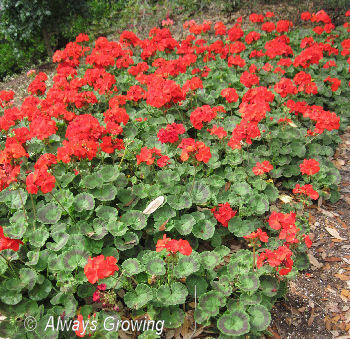 Even in what is late winter, Orlando, Florida, was filled with flowers and colorful plants. While we were there, a cool front came through, but that didn’t stop the tropical feeling the plants gave to the area. Walking around Sea World made me want to go home and start planting, but, unfortunately, the ground is still too cold here to put in tropicals. The mass of plants really made an impact. To start with, flowers were not the only way to make an impact. 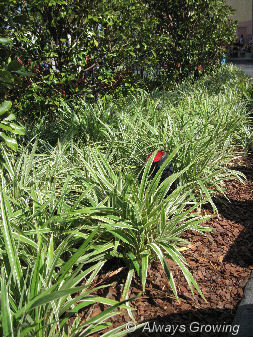 Foliage was very important in the mass plantings. First is the variegated shell ginger with knockout roses. 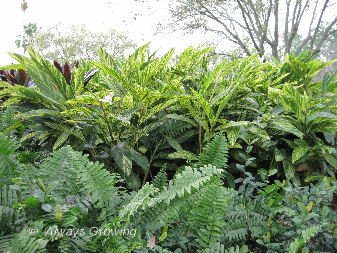 The next photo shows variegated shell ginger with macho ferns in front. 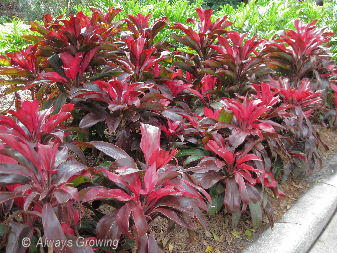 Of course there were stands of the red ti plant (Cordyline teminalis) all through the area. I have a few of these plants, and this year, I will make sure to group them all together for a bigger impact. A mass planting of variegated flax lily (Dianella tasmanica) made me want more of this plant. I planted this in my garden about six years ago, but seeing this bed made me realize I need to move mine closer together and divide them to make more plants. Of course, the crotons were lovely. Usually, crotons remind me of autumn because of the deep yellows and reds, but these did have a brightness to them. Lest you think that there was only foliage around, let me assure you there were flowers also, and not just in hanging baskets like my last post. 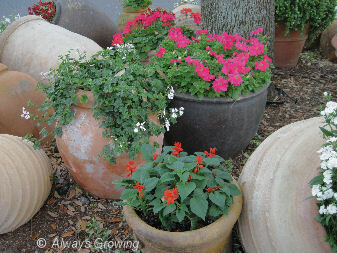 Geraniums, dahlias, impatiens, and other flowers were all represented. Around this time of year I start to get spring fever, that urge to go outside and dig around and plant something. Seeing all these plants, that for us are summer plants, certainly didn’t do my spring fever any good. I love plants that change. You know, the ones that look one way in the sun and one way in the shade. Coleus is one of those plants. 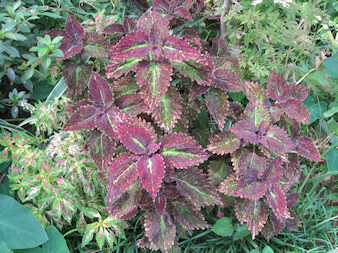 In fact, some coleus can look so different depending if they are growing in sun or shade, that they could be mistaken for completely different varieties. Sometimes, they do still look similar, just different colors seem to come out. 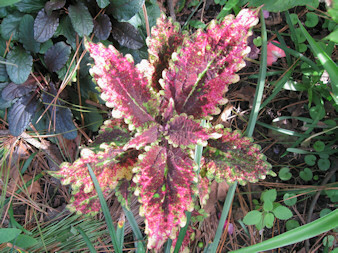 An example of this chameleon ability to change colors would have to be Lemon Twist coleus. When I bought it, it was green with purple stems and leaf edges. The one I planted in a container that stays on the shady front porch still looks that way, with the purple accents complementing the Persian Shield planted with it. Another piece planted in the garden where it gets more sun, shows much more of the purple in its leaves. Even the undersides of the leaves are a deep purple. I think that as more new leaves emerge, they will display more of the purple color, and soon this sun planted one will look so different from its shady sibling. 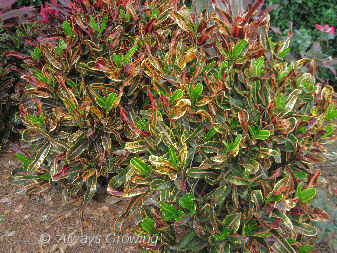 Another coleus that does this is Solar Sunrise. In the sun there is great color, but in the shade more green. 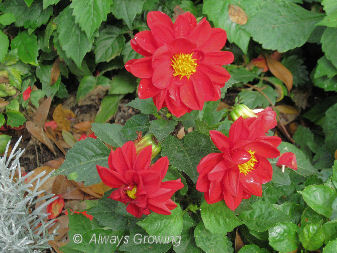 Alabama Sunset is another plant that can look totally different depending where it is planted. In the sun, it has big rusty colored leaves, and in the shade the chartreuse color is dominant. Since it is so easy to root coleus and make new plants, with these sun/shade differences, if you plan the placement of these plants, it will seem as if you have more varieties of the same plant. Also, if you want certain colors to come out, making sure that they are planted where they get the proper amount of sun will ensure you get the look you want. I know I will be moving my containers of Solar Sunrise into more sun because I want the pink colors to come out. I just find this sun/shade difference that many plants display to be fascinating. Yesterday, when I was looking for flowers to record for Garden Bloggers’ Bloom Day, I was anticipating very few flowers because of the recent hurricanes. 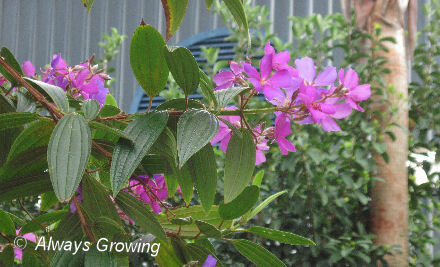 I was surprised how many flowers still looked good even with all the bad weather we have had over the past two weeks. Even though the flowers looked fine, there were not as many in number as there usually would have been without the storms. One thing I did notice as I walked around was the colorful foliage that made up for the lack of blooms. 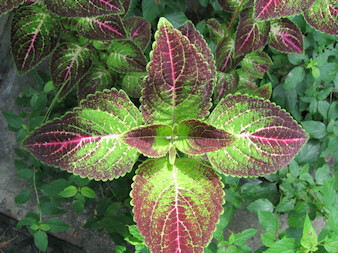 The coleus, which has rather thin and delicate leaves, wasn’t shredded as might have been expected. It looks fine and adds color where it is needed now. 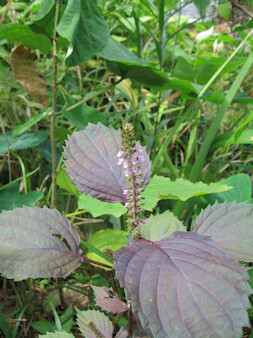 The perilla is just starting to flower. Sometimes it is hard to find, so I always let this go to seed to be assured that some will appear in the spring. Its lovely dark maroon leaves contrast with the daylilies around it, and the leaf color picks up some of the color of the Japanese Maple that grows off to the side. This plant always reminds me of my father’s aunt. Aunt Lessie lived in the country and grew this plant in her garden. I remember it well because the leaves were such an unusual color at that time. This was well before the dark colored foliage became popular, but now this old-fashioned plant fits in with today’s gardens which often features plants with purple leaves. 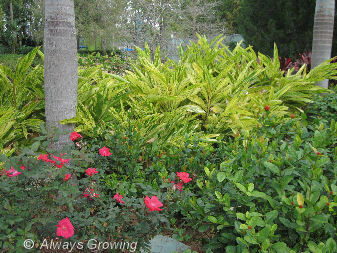 I am sure I could have found more examples of colorful foliage making up for the few flowers. While we may feel that flowers are essential in a garden, we have to remember that may not be necessarily true. So, for color in the garden, we may want to remember that sometimes no flowers are needed. Now that summer is starting to wind down, many plants that die back in the winter are at their peak. One of these is the hidden lily ginger. This clump in the side garden is about three years old and is seven feet tall. It makes a nice screening from the neighbors next door. Next spring, I think I will divide this clump up and spread it out a bit so that the plants are not as thick. That way, it will be a longer screening and give a bit more privacy. I wrote an earlier posting of the hidden lily ginger’s flowers which are very attractive. 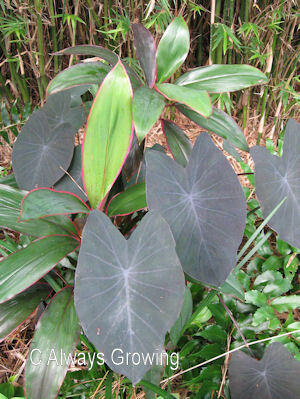 While I do like the flowers, it is the large leaves that I find most appealing. They are a bright green with a burgundy stripe down the middle. The older the plant is the larger the leaves. 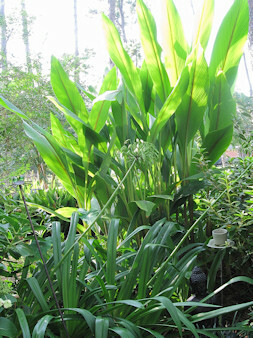 These leaves do not tear up like a banana leaf will sometimes, and they give a real tropical feel to a garden. The only downside is that this plant is not evergreen. In late September, the leaves start to yellow and soon must be cut down and placed in the compost bin. I always regret that fall brings the demise of this favorite plant and look forward to spring time when it will reappear.